I’ve had several people find my first post aboutmacaroni and cheese, and tell me that they don’t feel confident enough to try it without a more formal recipe. I am happy to help, so I have developed this recipe from my method. Before you scoff at my adding mustard to this, it brings out the cheesinesses of the sauce, and guarantees you’ll love it. Plus, over the summer I was at the Taste of Madison, and a comfort food style restaurant there was serving macaroni and cheese. It was amazing – oh, and tasted exactly like mine. 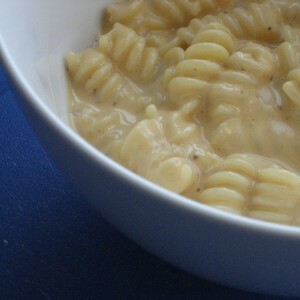 Not only that, they had used the same pasta that I have come to use, cavatappi. But don’t worry if you don’t have that, any short pasta will do. First, bring a pot of water to boil for the pasta. If the water boils before you are ready to cook the pasta, just turn the burner off. Once you’re ready to cook, turn the burner back on to high, and it will only take about 1 minute to boil again. It is much easier to have it waiting for you, than the other way around. Meanwhile, sweat the onion in the butter over low heat until it is very soft; about 5-8 minutes. Add the flour and stir to make a roux – cook for 3-4 minutes. Add the paprika, a little pepper, and mustard. Then, whisking constantly, add about half of the milk, and continue to whisk to ensure there are no lumps. Once it is smooth, add the remaining milk and bring mixture to a boil. Once bubbles begin to break on the surface, the sauce is as thick as it will get. Waiting to add the cheese until you are ready to serve, take sauce off heat before adding cheese bit by bit until melted, making sure to stir constantly while adding. Wait to salt the sauce to taste until the cheese is added to the sauce. Once the pasta is cooked and drained, toss with the sauce and serve – this is a no-bake mac and cheese. There are a few reasons I don’t bake it: 1) I can’t wait that long to eat pasta or cheese, let alone both together; 2) I hate making more dirty dishes than I have to, and it doesn’t add to the overall flavor of the dish; 3) I don’t like over cooked pasta; and 4) I don’t need crunch on it – it detracts from the creamy deliciousness. Feel free to disagree.